Magic with a young wizard theme! 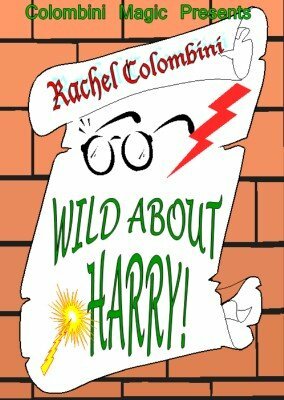 Rachel has put together what we believe to be a unique collection containing material featuring the famous character so well known and loved the world over - Harry Potter. You will get a full act and many more ideas to customize standard tricks into this particular kind of show. Suitable for children and adults alike. BAFFLING BOOK: A wonderful book test using Harry’s book! THRU THE WALL: A solid wall is shown. Suddenly a hole appears in the wall! OWL MAIL: The white owls deliver a special greeting! FLOATING FEATHER: A feather magically floats on an open book! SORCERER’S SURPRISE: Strong magic with two sets of ten cards each (with Harry related pictures). JUMBO SURPRISE: You predict a FREELY selected picture! MONEY DIE BOX: A coin vanishes and reappears elsewhere. Lots of comedy! SPOON SPINNER: Two spoons: One spins at the bottom of the other in mid air! DIAGONALLY: A card is selected among nine and matches your prediction! MARAUDER’S MAP: A nine-piece map is used for a stunning prediction! If you love Harry Potter you cannot afford to miss this great download.